Anya Hindmarch is a fashion brand based in London, specializing in accessories and luxury leather goods. Anya’s designs are showcased in various flagship stores worldwide including New York, Tokyo and London. However each collection also finds a place in the world’s more renowned concept and department stores, situating her product as a must-have item for each season. For the purpose of this assignment I have chosen Barneys New York to analyse in contrast to the Anya Hindmarch flagship store on Madison Ave. As research for the assignment I visited both stores, examining the product that was merchandised, the categories that were included and the relationship that existed between the two. There is an obvious difference between the two stores as Barneys is limited in the size of product available and features only a select few styles within the categories mentioned above. It is however, interesting to note the unique relationship which exists between the brand Anya Hindmarch and Barneys, as the last collection was launched by transforming the lower level into a Hindmarch 'construction site' which showcased unique pieces that were made specifically for Barneys. The below images illustrate how the stock was visually merchandised for this purpose. For the purpose of this assignment I have spotlighted the sub category of ‘Clutch Bags’ which feature in both stores yet in a distinct and contrasting manner. Research was undertaken through visiting both retail stores and analyzing the extent of purses and wallets as well as the different methods of merchandising which reflects the value in the categories. The clutch bag has always been a distinct product in each Anya Hindmarch collection, varying in style and design depending on the season, while a consistent theme and silhouette remains constant. The clutches found in the Anya Hindmarch flagship store on Madison Ave range from novelty bags with gold chain details, to box-like clutches that feature quirky bespoke designs on each. This category in store includes a more casual ‘pouch’ range, with a zip closure and detail found in limited edition Hindmarch key-rings. The flagship store not only carries the main line of purses but also features limited edition pieces that are unique to that location- in this case it is the Rainbow Crisp Packet clutch line exclusive to Madison Ave, New York. Through visiting the Barneys Department Store it was clear the purses and wallets category were limited in the colours available as well as the styles on stock. The visual merchandisingwas limited in space which made it harder to shop the collection in this environment as categories were not differentiated and organized as clearly. 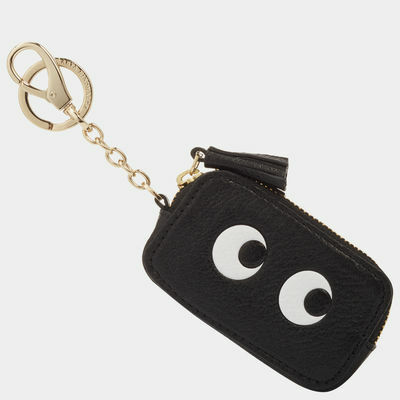 The assortment for Barneys included those products with a more classic aesthetic to the Anya Hindmarch brand, including purses and wallets in neutral tones and traditional shapes with only a few bespoke pieces on stock. The relationship between flagships and department stores has traditionally been one of compromise and successful brands have certain buying strategies set up to ensure the product is distributed to generate the most amount of sales in their given location. While Barneys carried various pieces from each Anya Hindmarch category, they did not carry any footwear styles. Perhaps this is because of the customer base being different in both the Madison Ave and Barneys store, as the flagship shops attract a loyal customer base with the purpose of visiting the shop for a one-stop buy as they have access to the entire brand’s collection. 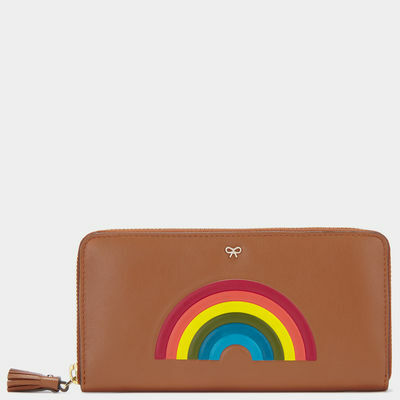 The stock in this store is constantly and is the first to receive the new collection to ensure the Anya Hindmarch internal retail outlets generate the first sales and offer exclusive services to regular customers. Taking the footwear category for example, it is not traditionally an iconic Hindmarch piece, however selling through this location may be a means to test product and the sales of this more niche market. In contrast to this is Barneys limited stock, whereby the Anya collections exists next to a wide range of competing brands which share the same floor space on level 1. In contrast to the range of categories found in Madison Ave, Barneys does not stock any footwear styles, perhaps due to the limited styles available from their buy sheet or a choice of Barneys due to their customer behavior. Another reason for the lack of footwear category may relate to the existing footwear that Barneys carries, being notorious for their scope of brands, high prices and affiliations with exclusive designers. While Hindmarch has established herself as a leading brand in bags and accessories, her footwear is less celebrated, perhaps another reason for Barneys not including this in their collection. Barneys New York epitomizes luxury department store, yet offering a twist of quirk and creativity that transcends both time and competitors. The department store showcases the crème de le crème of designer collections, and each department is curated with exclusive pieces, designer affiliations and original themes that keep customers returning to join the experience. With a reputation for high end designers, Barneys New York offers a unique retail experience and curated collection where its customers can view, buy and interact with the brands. Both demographics and physiographic must be taken into account to pinpoint the profile of the typical Barneys target audience. Listed below are characteristics taken from both which represent these customers. A typical Barneys customer is fashion forward, with a passion and interest in the constantly changing trends and an open attitude to new designers and unique styles. They have a desire to shop the latest collections, with a niche interest in exclusive products and limited edition collections. The regular Barneys customer is in a high-income demographic bracket, as they are able to afford the high-end designer collections, particularly as they changing from season to season. This customer trait changes slightly depending on the time of year, for example post-Christmas sales or the department in which they are shopping. For example the Barneys Co-Op collection offers a more mid-range price on apparel and accessories while the designer collections are high-end, more expensive and therefore more exclusive. Often, the Barneys collection showcases the more acentric styles from each designer. For example while the classic Acne Studios styles and colourways will feature, they will also showcase a more limited-edition vibrant palette or quirky pattern. This speaks to the customer audience as it attracts those with a sense of unconventional style and willingness to branch out from the mainstream. The age of the customer relates to each of the above traits, whereby Barneys offers a younger audience (17-30 yrs) the chance to shop a uniquely curated collection with loud colour ways and an interesting appeal. However, the department store due to the price range of products and exclusivity of shopping naturally attracts an older clientele (30-55 yrs) with the ability to shop entire collections and establish and loyal customer relationship with the brand. Barneys is known for their elite collaborations with high-end brands and celebrity affiliations, for example Kayne West's Yeezy line was launched with live models in Barneys to debute his first collection. The target audience is therefore in touch with the pop-culture aspect of the brand, seeing value in this relationship the brand has with high profile models, musicians and artists. The Barneys brand offers an up-to-date news feed through ‘The Window’ accessed through their online store, a constant thread of fashion news which offers their customers another avenue of interaction into the Barneys experience. An online platform where Barneys products can be purchased and accessed for sale prices, exclusive deals to the brand while still remaining aesthetically pleasing. Offering a glance into backstage editorial work, affiliations and collaborations with designers and fashion icons. This services offers regular customers their own ‘Barneys Bag’ which is based around a points system per purchase as well as offering perks such as complimentary shipping and returns, valet parking, alterations, beauty treatments and exclusive viewing on new collections. Personal shipping is offered to customers in need of assistance while in store, booked online in advanced and tailoring the experience directly to the customers needs. Barneys calls this ‘shopping with benefits’ appealing to the target audience through style advice, gift ideas, private presentation spaces, and personal alterations. Through analyzing the services and products that Barney provides their target audience there is no doubt a regular customer base exists because of the continual efforts of establishing a personalized experience for the individual. Whether you are a one-off customer or shopper from overseas visiting the store for the first time, or a regular customer with a personal shopping affiliation the brand offers a unique retail experience. The key benefits derived from the services outlined above embed into the customer a relationship they have with the shop, the people who serve them and the products they buy. Every customer walks into a store hoping to receive a ‘special’ treatment that is unique to that brand, particularly in a high-end boutique such as Barneys. Through subtly providing services such as ‘The Window’ and personal shopping, this relationship is instilled into the Barneys target customer, which encourages regular visits and an overall high regard for the brand.